Clearleft is hiring, come work with us! 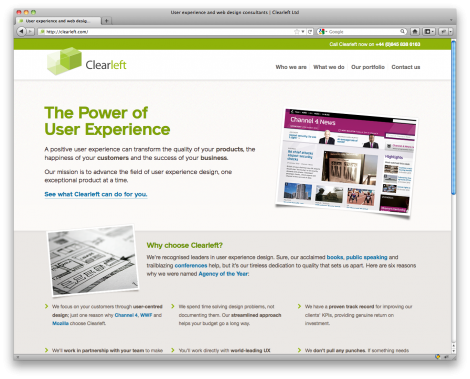 Great projects: the first thing I noticed when I started at Clearleft was the way sales work here. We get a fairly large volume of incoming calls from prospects, which allows us to be picky about the work we take on. We also tend not to have overly prescriptive work-plans. Proposals are written to allow flexibility, so you get to choose the right approach for your project. This makes it much more fun. Professional freedom: there’s no expectation for you to have your bum on the same seat for the exact same hours every day. There’s no macho “who can work the longest hours” nonsense here. You’re trusted to stay on top of your project work without being nannied. Time to write: if you sometimes feel like writing articles or blog posts at work, you can. In fact, it’s encouraged. Feisty discussions: Clearlefties often lunch together, share knowledge and chat. Never eat a sandwich alone again. Team support: if you get stuck on something, all you need to do is turn your neck and ask for an opinion. I’ve noticed everyone here is very willing to drop what they’re doing to help out. My work has improved hugely as a result. Conferences: have your say and help shape Clearleft’s conference line ups. Choose the conferences you want to go to without having to justify the use of your conference budget. UX is such a sociable industry – at Clearleft you get to fully enjoy this fact. Training: everyone here loves learning. Since I I started at Clearleft a few months ago, I’ve already had advanced analytics training and I’ve got some improv comedy training lined up (for public speaking). Healthy lifestyle: everyone here is experienced and knows what kind of life they want to lead. It’s a friendly and calm environment, punctuated by excitement rather than stress. I’ve never seen anyone panic about anything.